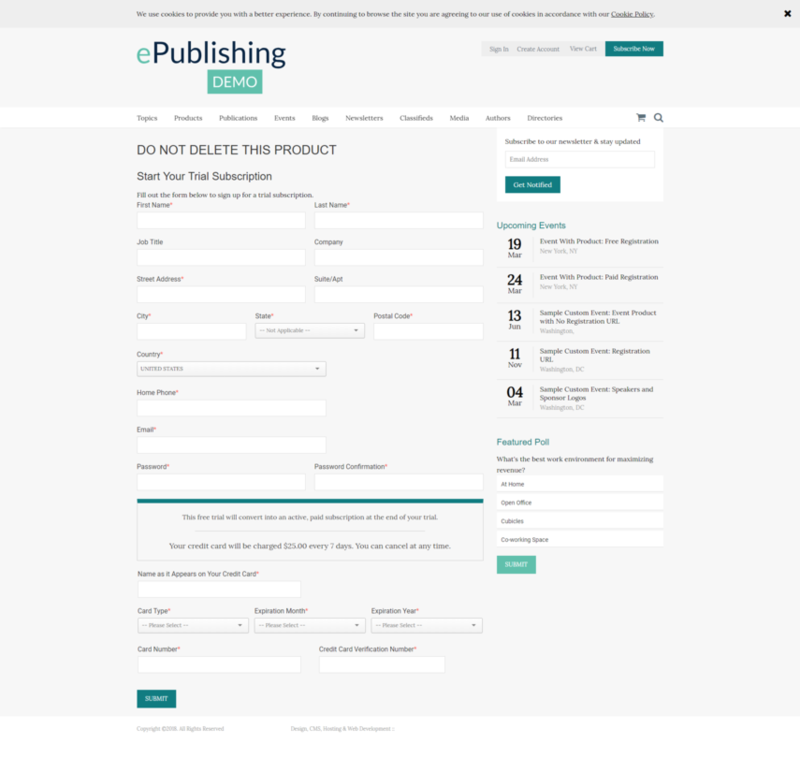 ePublishing Knowledge BaseePublishing Knowledge BaseePublishing Knowledge Base Creating, Managing & Selling SubscriptionsHow do a I create a trial that converts to an active subscription? ePublishing supports two types of trials. Trials that end and are not converted into recurring paid subscriptions. See this article. Trials that do convert into recurring paid subscriptions (requires Authorize.net as the payment gateway and automatic renewal billing enabled). This article is about scenario 2, a free trial that converts to a paid recurring subscription. This feature makes it so free trial leads automatically turn into customers, increasing your marketing tunnel throughput. If you are interested in scenario 1, then please see How do I create a standard free trial? Authorize.net setup as your payment gateway. Authorize.net configured for automatic renewal billing. The product setup as a recurring billing subscription product. We do not currently support trial conversions for products with product types other than subscription. The unit field for the product must be set to months or days. Note: your site may need to have /subscriptions/trial/id and the cancellation button on /user/profile styled. Your Project Manager can help you figure out if this is applicable to your site. Create a product in the Product Manager that you want used for the free trial conversion. See this article for how to create a product. As noted above, the product type needs to be subscription. 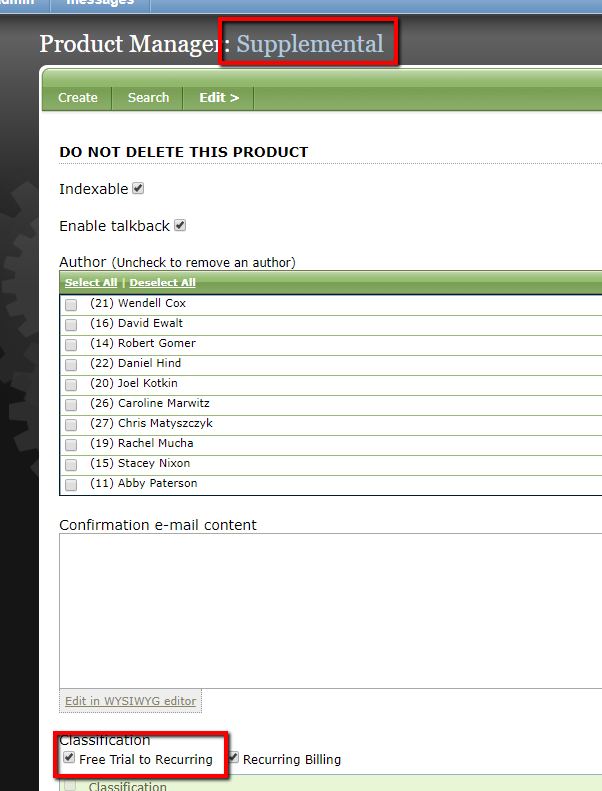 Go to Edit > Supplemental and tag the product with the classification Free Trial to Recurring (FREE_TRIAL_TO_RECURRING). For most sites, the hierarchy for this taxonomy is Classification > Subscriptions > Free Trial to Recurring (FREE_TRIAL_TO_RECURRING). Reach out to your Project Manager if you do not see this classification. 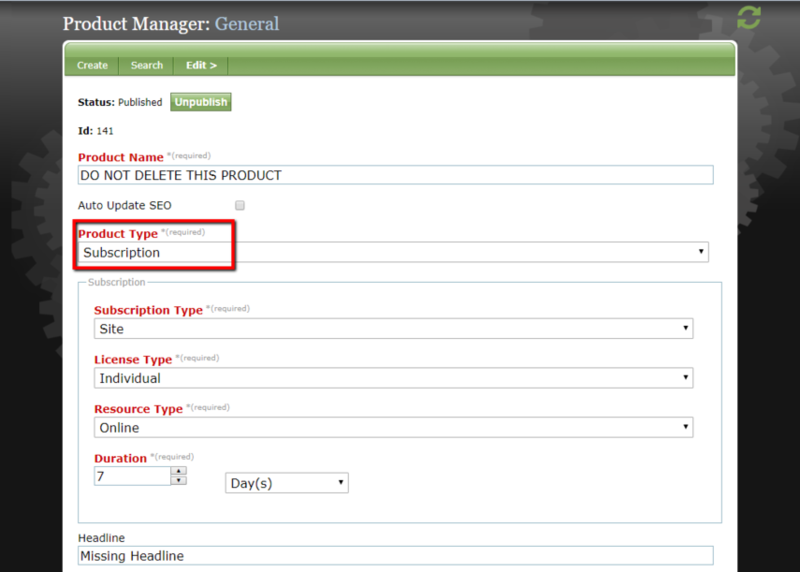 In order to make it a recurring billing product, then go to Edit > Custom. 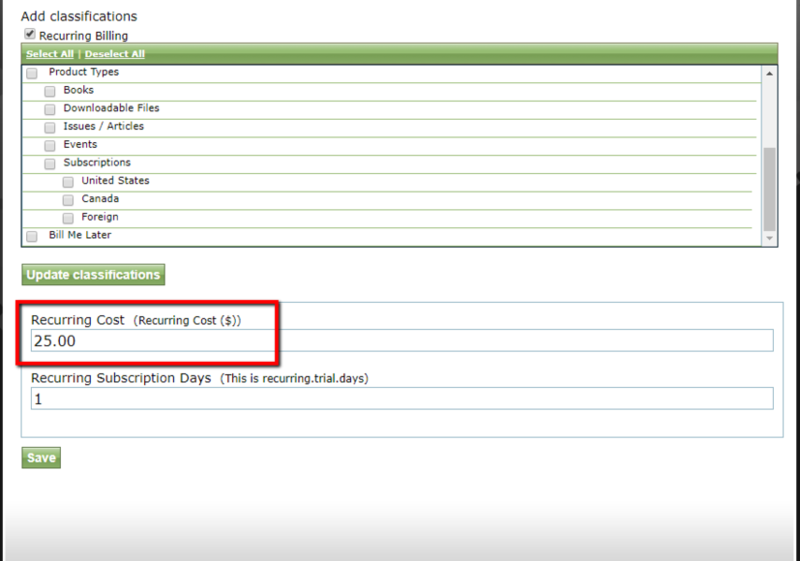 Click the box for Recurring Billing and then click Update classifications. In the recurring cost field, specify the amount for the recurring transactions. 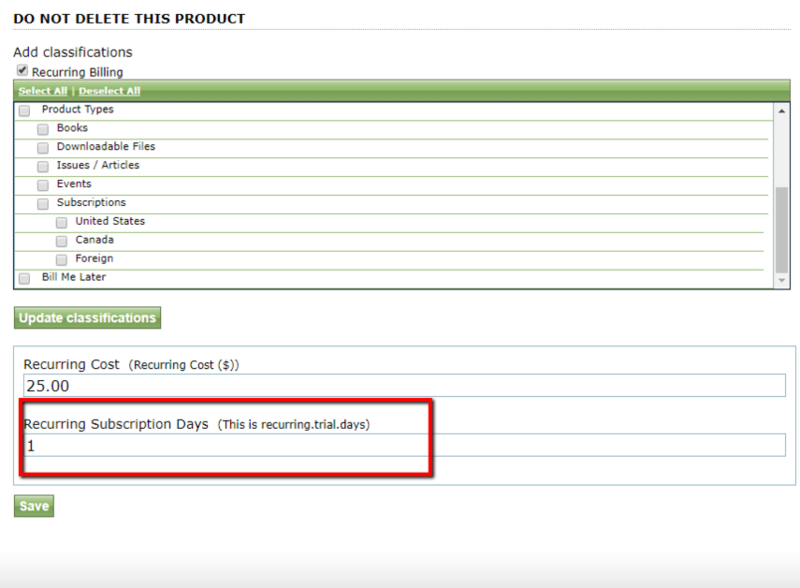 In the recurring.trial.days field, specify the number of days you want the free trial to last. Note: for some sites, the name of this field can vary. Ask your Project Manager for the name of the field for your site. Your product is now setup for the trial conversion. End users will sign up for the free trial conversion using the form /subscriptions/trial/id. The id is the product id. For example, if the product you setup has an id of 141, then the URL for ends users to get the trial conversion is /subscriptions/trial/141. End users simply fill out this form including their credit card information. Then the user will get the free trial for the length of time specified in recurring.trial.days and will be automatically converted to recurring billing subscriber. 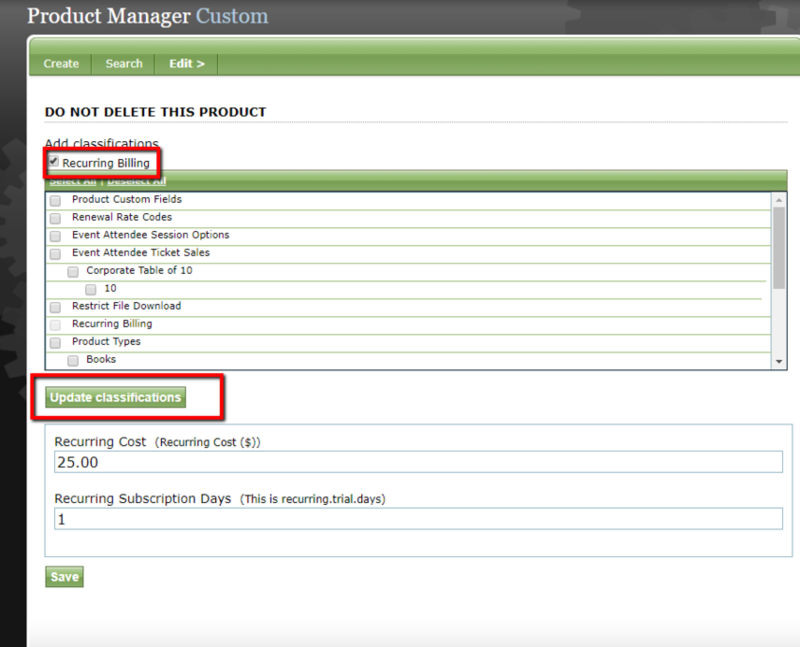 The cadence for the recurring billing is determined by the duration field in the Product Manager. Authorize.net handles the recurring billing. The duration field unit must be set to days or months, not weeks or years. A user is welcome to cancel the renewal billing any time by going to /user/profile, clicking on the subscriptions tab, and then clicking the CANCEL AUTOMATED BILLING button. This cancels the recurring billing in Authorize.net. The users subscription will be cancelled in ePub based on when the user has paid through. 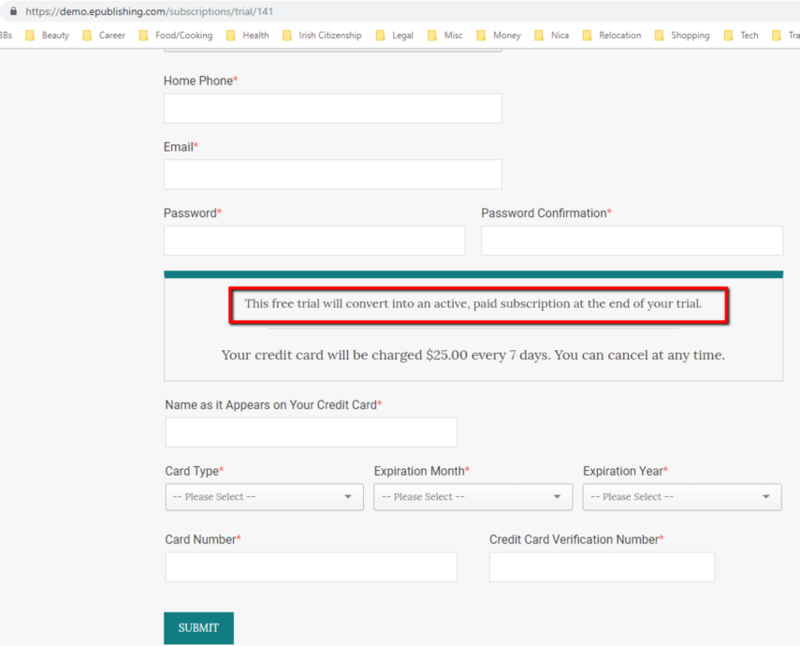 For example, if a user has been charged for a subscription through 1/30/20 and the user cancels on 1/19/20, then the subscription in will still be active until 1/30/20. 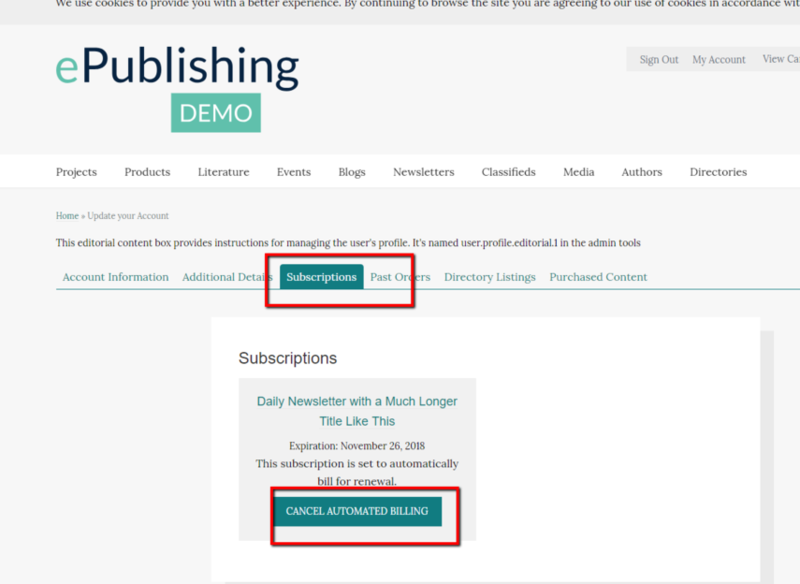 The form /subscriptions/trial/id has an editorial content field which shows up when the product is tagged with Free Trial to Recurring (FREE_TRIAL_TO_RECURRING). 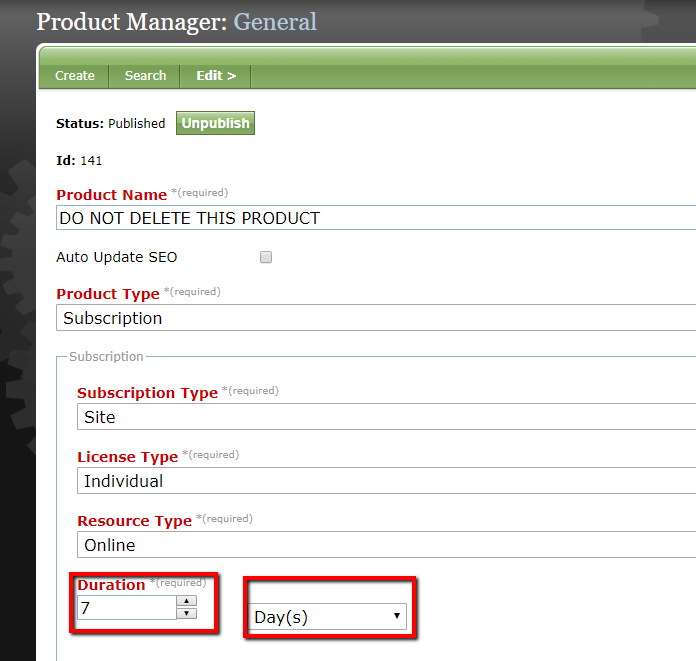 The name of the EC area is subscription.form.trial.recurring.bottom. It can be used to tell end users that their trial will convert into a paid subscription. The screenshot below shows where this EC renders. Prev: How do I create a standard free trial? Next: How do I create a simple Event?